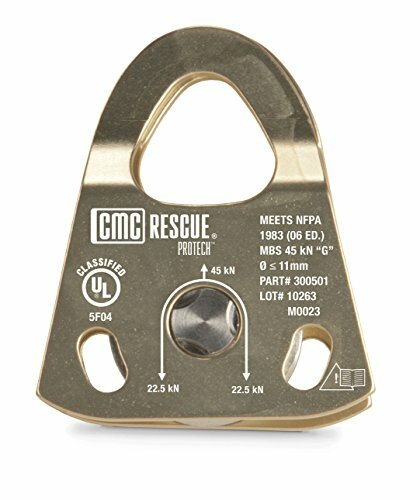 Ideal for mountain rescue, swiftwater, ski patrol, tower work or other technical uses, where equipment weight is a significant consideration, these lightweight, full-strength Prusik-minding pulleys feature extremely low-profile stainless steel hardware to reduce snagging on rocks, roots, and uneven surfaces. By machining the side plates, the thickness of the metal can be optimized to maximize the strength-to-weight ratio, a process that cannot be done with the raditional bent metal side plates. The unique axle assembly delivers a smooth side plate and impressive strength. The aluminum sheave is mounted on sealed ball bearings for high efficiency. Ideal for small block-and-tackle kits. Note: Not compatible with 1/2-in. (12.5-mm) or larger ropes. Working-At-Height / Industrial Rope Access / Technical Rope Rescue Working at height requires reliable, quality equipment. The ProTechTM Pulleys can be used with confidence for work positioning or fall restraint protection in work-at-height maneuvers for industrial rope access or technical rope rescue when used in accordance with the regulatory safety standards they fall under. Always use life safety equipment and gear according to the regulatory safety standards for which it is classified and/or certified.